63 MB|120+ more on the way! PRICE WILL GO UP AS NEW SETS ARE ADDED. BUY NOW FOR THE BEST DEAL! 3. St. Patrick's Day Brick Building Pack <------Now Available! 4. Earth Day Brick Building Pack <------Now Available! 5. Easter Brick Building Pack <------Now Available! 6. Fourth of July <------Now Available! 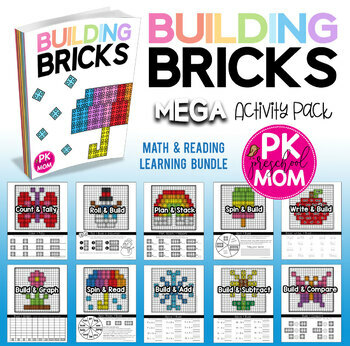 Hands-On learning key math and reading skills with LEGO™ or Strictly Briks™ Building blocks. Hard: Students complete the reading and math activities as they build the pictures. 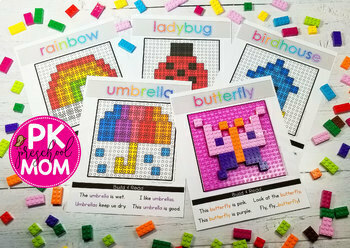 Each picture has a different skill for students to showcase. Graphing, Tally Marks, Inequlities, Planning, Roll & Build, Spin & Read Sight Words, Addition, Subtraction, Spin & Build, Sight Word Writing. 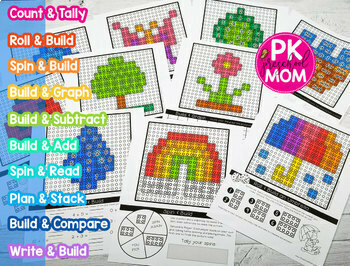 Medium: Students follow the steps to plan then recreate the picture without a colorful template. Students must look at the smaller colored grid for reference as they recreate the build on their mat. Easy: Students build the picture then practice finding their word in the sentences below. Encourage young students to say the word as they touch it with their finger. Older students can read the sight word sentences for reading practice, or write them on their own notebook paper. 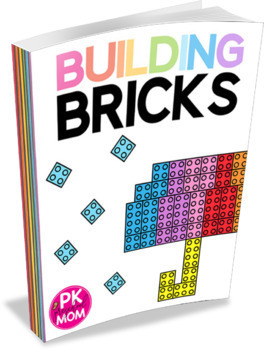 Required Materials: Students will need bricks such as LEGO™ or Strictly Briks™ in a variety of colors. Brick sizes will be 2x2, 2x3, or 2x4. No other sizes are needed for this pack. Optional: It is recommended that students have a base mat 6.25 x 6.25” or larger to build their pictures. Younger students might benefit from a transparent 6.25” square base they can place exactly over the building mats to see where to place their bricks (see the medium level above). 120+ more on the way!